The Heavy Duty 4411 sewing machine is designed with your heavy duty projects in mind, from denim to canvas. Thanks to the machine's powerful motor, you have extra high sewing speed to save you time. With Adjustable Presser Foot Pressure, you can also sew very lightweight sheers, and the stainless steel bedplate allows fabrics to glide over the machine with ease. Create original costumes, sew personalized fashions or transform your home with new decorator pillows and curtains. Among the 11 stitches is a four-step buttonhole, so you can make buttonholes with ease on all sorts of fabrics. The Top Drop-in Bobbin makes it easy to see your thread so you don't run out in the middle of a seam. 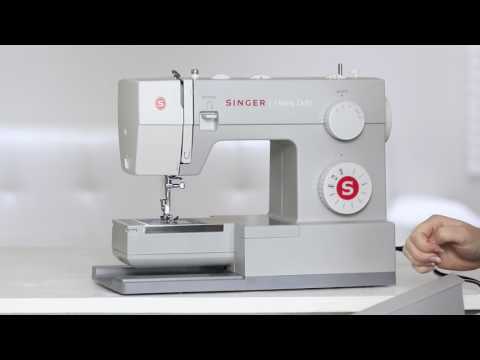 Thanks to the SINGER Sewing Assistant App as well as the Online Owner's Class video, help is available anytime you are.